Since I live overseas, away from my family and family traditions, Canadian Thanksgiving almost always sneaks up on me. I like to at the very least make myself a pumpkin pie, but this year was woefully unprepared despite the six cups of pumpkin purée stashed away in my freezer. Most of our expat friends are American, so we tend to have a more structured Thanksgiving celebration in November, and, since Google Analytics tells me that a whopping 60% of my readers are American (Canada is only 9%! Where you at, fellow Canadians?) I’ve come to view Canadian Thanksgiving as a bit of a warmup, if not a handy reminder that I need to get myself ready. 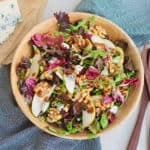 Whether you just celebrated Thanksgiving over the weekend, or whether you’re planning your menu for a November dinner, or whether you’re just in the mood for a dang tasty salad, I thought we could all probably use a break from the pumpkin party and focus on another fall favourite: the Pear and Gorgonzola Salad. 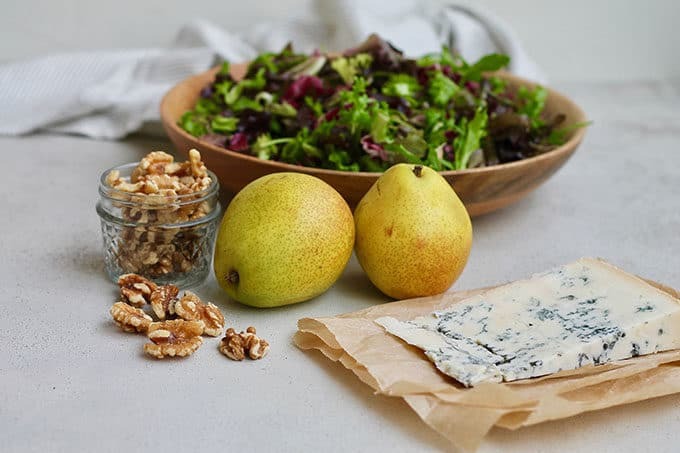 What goes into this pear and gorgonzola salad? Pears! Preferably pears that are still a bit firm but not too crunchy either. Perfectly ripe is what we’re going for. Gorgonzola cheese. Heads up! There are two times of gorgonzola, either dolce or picante. Dolce is soft and goopy and perfect for smearing on crackers or stuffing into figs. Picante is sharper tasting and more crumbly. It’s picante we’re using in this salad. Salad greens! Go with your favourite mix here. The one I used has radicchio, frisée, red leaf lettuce, and arugula. Walnuts! We’re going to make some quick stove-top maple candied walnuts. Maple Syrup. For the candied walnuts. Butter. For the candied walnuts. Plus we’re going to make a quick and easy vinaigrette with Dijon mustard, balsamic vinegar, olive oil, and salt and pepper. How do I make this salad? Start by making the candied walnuts. Melt the butter over medium-low heat, then whisk in the maple syrup. Add the walnuts and let ’em cook, stir often, until the maple syrup has caramelized on the walnuts. This should take about 3 to 4 minutes. Remove from the heat and set aside. Make your vinaigrette. I like to combine the Dijon, balsamic, olive oil, salt, and pepper in a glass jar with a lid. Shake the heck out of it and your dressing is done. Taste, and adjust seasonings if necessary. Then, put your salad greens into a serving bowl. Slice the pear and distribute over the top. 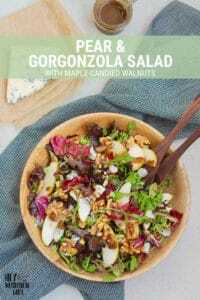 Crumble the Gorgonzola and scatter across the salad. Add the cooled, candied walnuts. Lastly, dress with a drizzle of vinaigrette. That’s it! 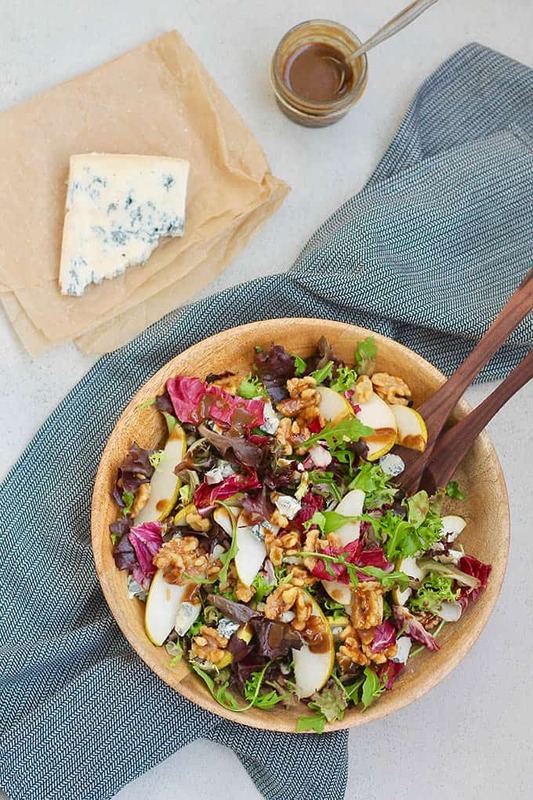 Your Pear and Gorgonzola Salad is done did. Can I make this salad in advance? 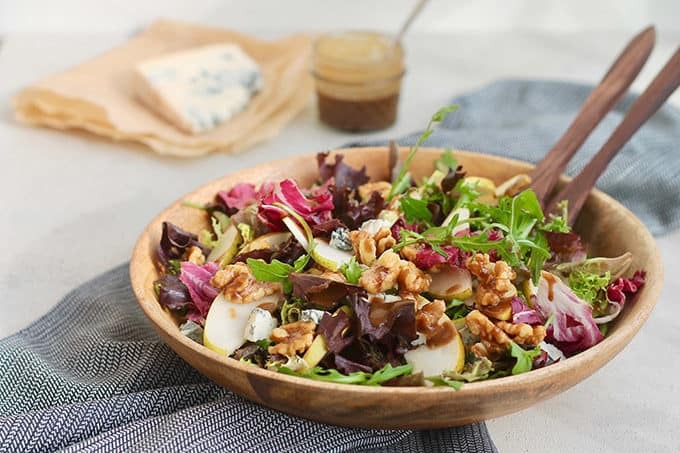 You can make the candied walnuts and the vinaigrette in advance. I recommend waiting until the last minute to slice the pear and dress the salad. 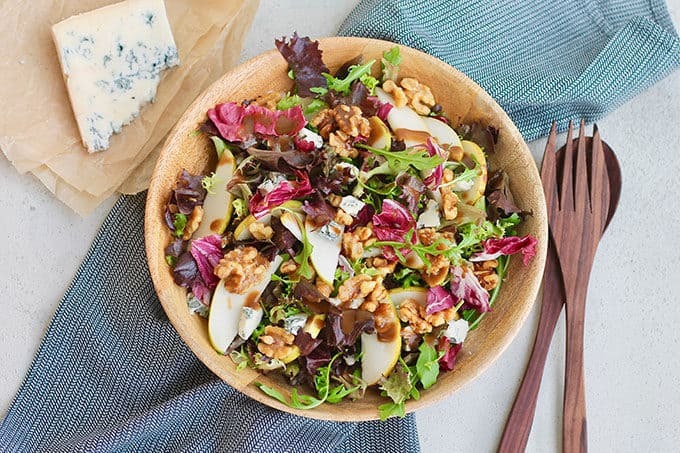 Is this pear and gorgonzola salad potluck friendly? Definitely! Layer everything EXCEPT the dressing into a salad bowl, and tuck a jar of vinaigrette alongside. Cover with plastic wrap, transport to the potluck, and dress the salad when you get there. Can I make a vegan version of this salad? We live in a glorious age where the selection of vegan cheeses gets better and better every day. See what you can find! Or, this guy has a recipe for DIY mould inoculated vegan blue cheese you could try if you were feeling adventurous. I haven’t tried it, but the reviews are pretty good! Is this salad gluten free? You bet it is! Help, I can’t find Gorgonzola! Try the deli counter of your supermarket or a specialty cheese store in your area. Or just use any old blue cheese you like – I won’t tell anyone! Hey Nutrition Lady, what’s the deal with pears? Pears are a member of the rose family, together with apples, apricots, cherries, peaches and plums. All of the varieties of pears most commonly available including Bartlett, Anjou, and Bosc are members of the European pear category. There is a rounder, more crisp category of pears called Asian pears, sometimes also (erroneously) referred to as apple pears. When it comes to the health benefits of pears, they pretty much rock the antioxidant and anti-inflammatory categories, with phytonutrients such as flavonols and anthocyanin (in red-skinned varietals) topping the charts. It’s worthwhile buying organic and eating pears with the skin intact, as research has shown that the skin of a pear contains roughly four times the amount of phytonutrients compared to the flesh, and about half of a pear’s dietary fiber. 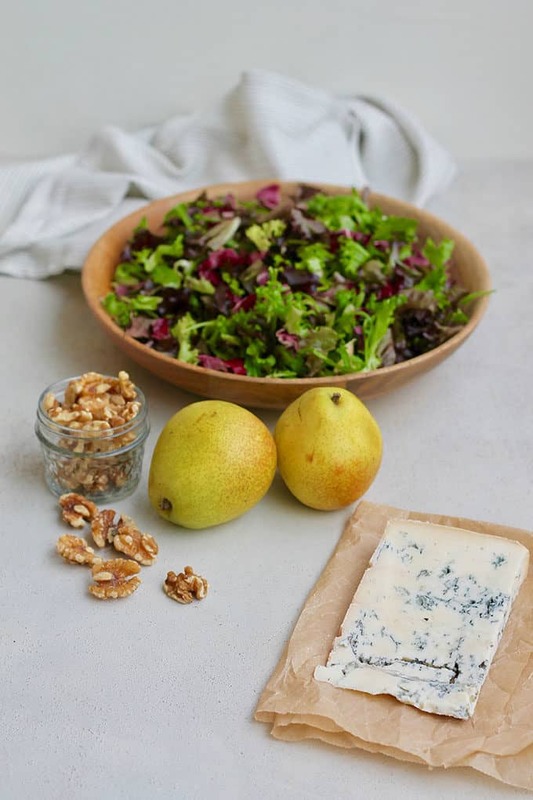 Pears are also a good source of copper, vitamin C, and vitamin K.
This green salad is such an easy and tasty recipe for the holidays. 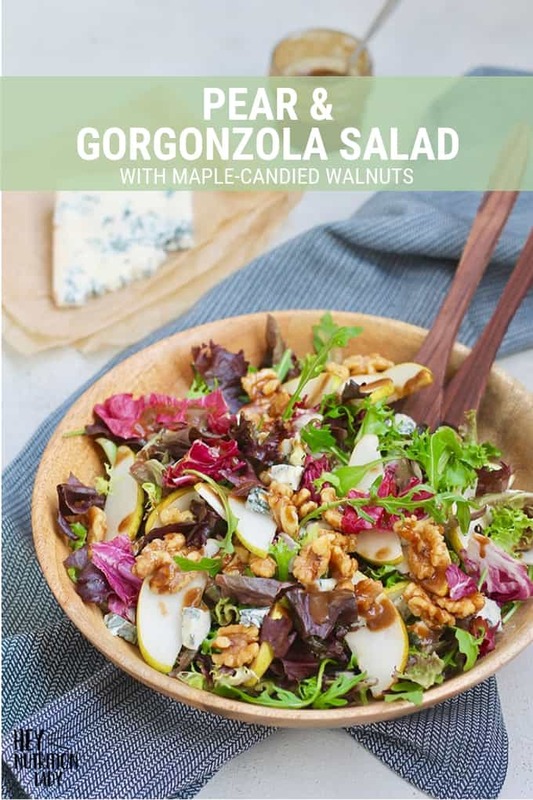 With maple candied walnuts, a quick and easy vinaigrette and a good amount of gorgonzola cheese, it's healthy and delicious. Melt the butter over medium-low heat, then whisk in the maple syrup. Add the walnuts and let 'em cook, stir often, until the maple syrup has caramelized on the walnuts. This should take about 3 to 4 minutes. Combine the Dijon, balsamic, olive oil, salt, and pepper in a glass jar with a lid. Shake the heck out of it until the ingredients are well combined. Put your salad greens into a serving bowl. Slice the pear and distribute over the top. 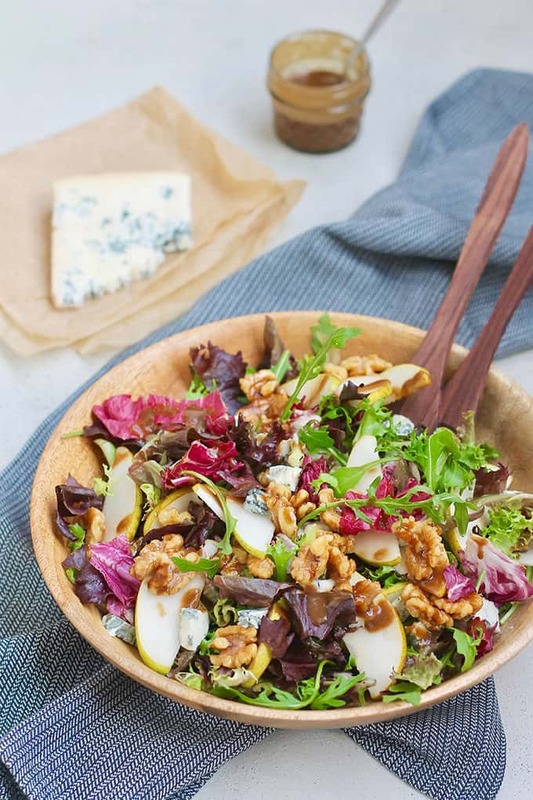 Crumble the Gorgonzola and scatter across the salad. Add the cooled, candied walnuts. Lastly, dress with a drizzle of vinaigrette. Salad serves 4 as a side. I'll admit to eating the entire thing for lunch one day. Is this salad potluck friendly? Definitely! Layer everything EXCEPT the dressing into a salad bowl, and tuck a jar of vinaigrette alongside. Cover with plastic wrap, transport to the potluck, and dress the salad when you get there. Help, I can't find Gorgonzola! Try the deli counter of your supermarket or a specialty cheese store in your area. Or just use any old blue cheese you like - I won't tell anyone! We love this recipe and it’s a sad fact of life that I didn’t enjoy gorgonzola until my 20’s. All the missed deliciousness! Whaaaaaa. There’s no time like the present for making up for lost time! An easy and tasty salad. Perfect for when you want something a bit special, make ahead, without a lot of slicing and chopping.